Newsday sports reporter Bill Nack’s story from June 10, 1973, the day after Secretariat won horseracing’s Triple Crown at Belmont Park. Nack died April 13 at 77. It ended, too, when Turcotte jumped off in the winner’s circle and groom Edward Sweat led Secretariat past the crowds from which long and sometimes braceleted arms reached out for the chestnut colt as he passed nearby. Hands slapped his muscular body. Hands shot up in fists. Hands were cupped over faces. Hand were holding hands and gesturing elation and awe. 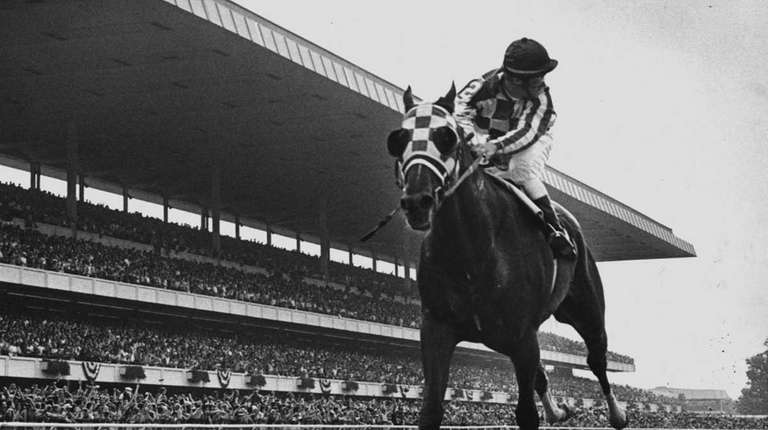 It also ended when Sweat led Secretariat through the long tunnel from the winner’s circle to the saddling enclosure, the big colt sweating heavily, his eyes darting left and right as the thousands of people lining the enclosure sent up cheer after cheer and shouted his name over and over. “Spectacular, just sensational,” said trainer Elliott Burch as Sweat led Secretariat past him through the paddock and out the paddock gate to the tunnel between the racetrack and the stable area. Secretariat had won the Triple Crown — he had won the last leg of the crown in record time, 2-1/5 seconds faster than any other Belmont winner had ever run the distance — so it was still ending, as if it would never end, as Sweat took him through the tunnel, still ending as crowds followed him on both sides, behind him, in the front of him, as he walked with that fine sense of bearing he has toward the barn where he would have a salvia and a urinalysis, routine tests for drugging. Trainers gathered in the testing barn and looked at the colt as Ed Sweat washed him off with water, scraped him with a water scrapper, and the trainers laughed when George (Charlie) Davis — the colt’s regular exercise boy who was holding him while Sweat scraped — kissed the colt on his nose. “He’s a great horse,” said John Campo, who trained the second place finisher, Twice a Prince. “He is,” said H. Allen Jerkens, one of America’s top trainers, who stood outside the test barn fence with his daughter, Julie, just to get a closer look at Secretariat. This was nearing the end of a long day for Secretariat, the close of a day in which he ran faster than any horse has ever run 1 ½ miles — the classic distance — in the history of the American turf. There he was, near the end of his day, drenched with sweat and water, an object now of adulation and awe, and a tired and thirsty horse whose day began more than 12 hours earlier, in a barn 100 yards away, in silence. It began in the dark of the morning while he slept. Down the shed row Secretariat was beginning the day in stall seven. Harris and the other stablehands were about to begin their days of the Belmont Stakes. Harris stretched, disappearing into a room nearby, and in the doorway light the Pinkerton vanished in the darkness toward Secretariat’s stall, returning an instant later to stand guard. Soon birds began rioting in the trees, the sky bluing, and horses stirred inside their stalls and it was nearing 5 a.m. The colt was lying down then, resting like a good horse, when the 2-year-old Capito — half-brother to Riva Ridge — poked his head from neighboring stall nine and looked about. Other heads quickly popped outdoors. Riva Hidge looked up both ends of the shed. Then stable foreman Henry Hoeffner arrive, pulling up in his car, and in a second he was strolling up the shed toward Secretariat’s stall. As Hoeffner walked past the tack room, Secretariat thrust his blazed face and massive chestnut neck from the door, giving Hoeffner the eye. Hoeffner stopped, looked the colt up and down, and walked away. It was 5:12 a.m. and a beginning. So the rhythm of the workaday routine began. Soon Edward Sweat, the groom of Secretariat, drove up in his car and climbed out in search of a cup of coffee. “I’m ready,” said Sweat, sipping it as he walked into the barn. “I’m ready as I can get.” Sweat set the cup on the windowsill in front of Secretariat’s stall. “Well,” he announced out loud to the shed, “Let me get old Big Red ready here.” The colt peered at Sweat, his ears pricked forward as he listened for the words, and he watched Sweat carefully as the groom picked up a fork and walked to the stall. There Sweat stopped, smiled as he raised his hands like an 1890 pugilist and said to the colt, “Come on, Red, get back in there so I can do some work.” The colt moved backward slowly, and Sweat ducked into the stall to work. It was 5:40 a.m. So Sweat quickly got the colt ready for Secretariat’s morning stroll, his only exercise on the morning of the day of the biggest race in his life. Sweat brushed the colt down, rubbing his glossy sides and back and shoulders. “He looks good this morning,” said Sweat, walking toward the stall. “We’ll take him out right now. Hey, Big Red, here I am, here I come.” It was 5:57 a.m. when he finished working on him and the colt’s regular exercise boy, Charlie Davis, led him from the stall to the outside walking ring. And Secretariat put on his show. Laurin himself arrived five minutes later, and the pace of the morning work seemed to pick up sharply, with Laurin going to the racetrack to see horses work, returning to the shed and office, stopping to look in on Secretariat when he passed the stall. And the colt gazed upon the hubbub as if it were just a mere abstraction. He backed into his stall, came to the door again, backed in again. The morning was swept up by rakes and swished into little corners by brooms, and he watched it all quietly. Sweat gave the colt a quart of oats at 10:30 a.m., three quarts less than he does on non-racing days. Secretariat stood in the back of the stall, as if brooding. “Now he don’t want to be bothered,” said Sweat. Work wound down. Stablehands went to eat, the stable emptying and the life of the racetrack easing back. Only Sweat crouched outside the shed washing towels at 10:20 a.m., beginning the long wait for the end of the afternoon. The colt was in his stall all through the late morning and early afternoon, alone but for Ed Sweat working in front of the stall and an occasional groom walking by and Tom Trotter Jr., the Pinkerton who replaced Fanning, standing on guard near the stall. The afternoon pressed on, with horses passing the Laurin barn to and from the races at the track. It grew late. And suddenly Edward Sweat dipped into the stall and started to get the colt ready, and the colt knew it. Again, the colt’s rations for the afternoon meal were cut, the Tip-Off that he would battle with other horses in a horse race. Sweat moved into the stall, brushing him and rubbing him, putting a shine on the coat, a luster. Then McClain, the assistant trainer, with a serious set to his face, strode through the crowd that gathered at the open end of the shed and said, “You all are going to have to step back, please, step back now. The horse won’t be able to walk through with a crowd here.” The crowd stepped back. It was 4:07 p.m.
George Davis jumped suddenly on the pony Billy Silver, walking him to the door of the shed to wait for Secretariat and the post parade. Angle Light, the colt who had beaten Secretariat in the Wood April 21, was led back sweating and sandy from the seventh race, finishing out of the money in that race before the Belmont. At 5:10 p.m., the loudspeaker in the stable area shouted that horses should be brought to the paddock for the eighth race, the Belmont. Then, out walked Secretariat and Sweat, with cameras clicking in the crowd. “Take it, Ed, take it,” someone yelled. Ed Sweat nodded and smiled and walked Secretariat through the tunnel to the paddock for saddling. All around the paddock, the crowds applauded, cheered, with one fan yelling, “Go get ‘em, Secretariat.” It was nearing post time. The jockeys came out, and Turcotte jumped on the big colt and the crowd cheered harder, more boisterously than before, and Turcotte smiled faintly, then seemed to stiffen his face. It was no time to take a bow. It was time to ride in the horse race of his life; a time to whip and beat all the horses, and to do it with the ease of breaking sticks. And it was a time to understand that some things are a long time ending, and for some they may never end at all. “He’s the greatest,” Davis said, kissing the colt on the nose.